A wedding anniversary is typically the most meaningful occasion for an important jewelry gift. High quality gemstone jewelry is a gift of lasting value and the major wedding anniversaries (first, fifth, tenth, fifteenth, twentieth, twenty-fifth, etc.) in particular are often commemorated with something special. Many women have definite preferences for anniversary jewelry. 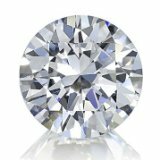 But for men who are unsure about what to buy, there is a list of anniversary stones that has been endorsed by jewelry organizations, such as the Jewelers of America and the American Gem Society. This list was inspired by the work of Emily Post in the 1920's, who first suggested a set of gifts appropriate for the different wedding anniversaries. 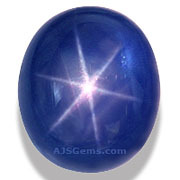 The list is structured so that the finer gemstones are assigned to the major anniversaries, with sapphire (5, 45, 65), diamond (10, 60, 75), ruby (15, 40), emerald (20, 35) and alexandrite (55) having prominent positions. 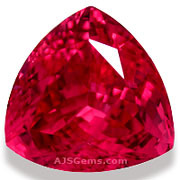 Most of the well known colored stones are represented in the list, as well as some lesser known gems such as spinel, iolite and imperial topaz. We have years of experience helping our customers select fine gemstones for special anniversary gifts. Our expert staff will help you choose a high quality gem that will delight your partner and fit your budget. We also work with custom jewelers here in Bangkok to set our gems in 18k gold rings, pendants and earrings. 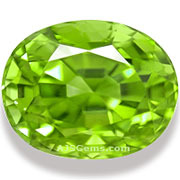 See our Gemstone Jewelry Gallery for custom designs created by AJS Gems and our customers.